Beirut-based start-up company Instabeat is bringing the ‘quantified self’ movement to the water with a device that lets swimmers track their performance, and its founder says crowdfunding has played an important role in development and marketing reach as well as funding. 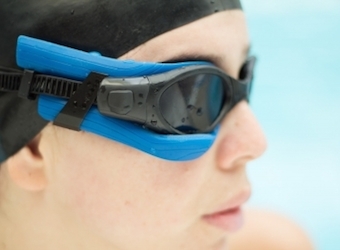 Instabeat is a waterproof device, attachable to conventional swimming goggles, which tracks, stores and displays real time performance information, allowing swimmers to optimise their training by monitoring their heart rate, the amount of calories burned and recording their performance zones. Founder and inventor Hind Hobeika, herself a former professional swimmer, first created the device in 2010 after noticing a gap in the market for similar performance trackers. “I’m a person who uses wearables for different aspects of my life, so I track my sleep, my heart rate, my food, but also I wanted to track my swimming… and it has evolved into a start-up. “I want Instabeat not just to be a swimming device, but to give you an overview of your lifestyle in general,” Hobeika told Marketing while visiting Australia for ThoughtWorks Live last week. Hobeika took to production through a combination of crowdfunding and institutional funding, discovering that crowdfunding pushed her initial concept to new heights. “Most people enter crowdfunding with the idea of getting dollars out of it but the benefits you get are far more than the dollars,” she said. The nature of crowdfunding offers startups the important initial response, something institutional investment can lack. The immediate reaction means small companies can dodge potential mistakes, and test and improve their ideas before putting an idea into production. “We got orders from 51 countries. I think even if you paid Google to get you targeted marketing in 51 countries you would need millions of dollars so that was far more worth it than the money we actually got,” said Hobeika. But crowdfunding is not without its challenges. Developers are accountable to their funders every step of the way. Funders naturally expect full transparency in the development process of the product they’ve donated to, and can become heavily involved, Hoebeika says. “Many people send us daily emails and very pissed off emails and we feel like we’ve personally hurt them. That adds a lot of pressure. “Early on in the journey, funders can feel like your investors, but funders are consumers, not investors,” she says. The Instabeat is currently in production and available for pre-order.